1. You will receive a link where you can download the certificate. You must make sure that is on your approved sender list. 2. 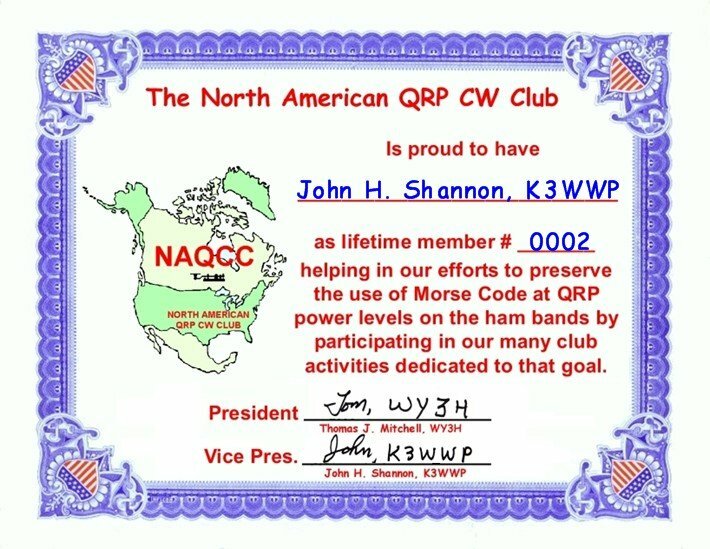 In the event you own multiple call signs, we can't put more than one set of call letters on a certificate without making the font too small to look good. However we can create a certificate for each call. EACH certificate MUST be requested via a SEPARATE email. 3. Send an email to with "NAQCC Member Certificate" as the subject. In the body of the email put your name, call letters, and NAQCC membership number. The name will be printed on the certificate EXACTLY as shown in the email. If you want your full legal name, use that. If you want your ham nickname, use that. Be sure to use the case you want, i.e all capital letters, all small letters, or normal capitalization. 4. When you receive the email and download the certificate, it is up to you to do what you want with the attached certificate. They will print out nicely on a good color printer. If you are handy at editing image files, you can resize it as you want. It was designed to be printed at 11 by 8 1/2 inches, but should look nice both smaller and bigger than that if your image editor or printer software resizes it correctly. 5. Please let us know how things turn out after you process your certificate. Let us know of any problems, or hopefully let us know how smoothly things worked out for you.